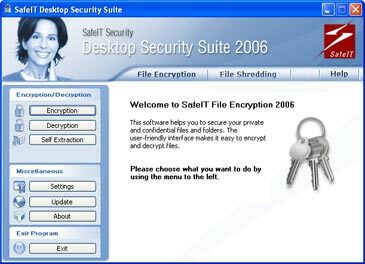 Buy SafeIT Desktop Security Suite and get both SafeIT File Encryption and SafeIT File Shredding in one powerful suite. Certified and awarded software suitable for both the enterprise and private user. Encrypt sensitive documents and other private digital information you have on your computer. Product reknowned for it's user-friendliness. Supports up to 480 bit strong encryption. Ideal for encrypting attachements to be sent by email. The software also allows you to permanently remove selected information on your hard drive and other memories. When you delete a file, empty your Recycle Bin or even format your hard disk, the information is NOT removed from your computer. These commands only alter the structure of the drive, leaving most of the data intact and recoverable with software tools easily available. This means that someone else can recreate the files that you think you have already deleted. The only true way to permanently remove unwanted files and data is to use file shredding software. File shredding utilizes an advanced algorithm technique of overwriting your files multiple times so that the information contained in them is no longer readable, thus destroying the original data forever.